"Hey, haven't you heard? I'm innocent!" Its second season in color, The Andy Griffith Show regains some ground as the show adapts to the cast changes and the writing evens out between episodes. After unsuccessfully replacing series icon Don Knotts in the sixth season, Andy is now running the sheriff's office solo. Crimefighting in Mayberry was never that much of a full time job, so this season tends to focus on relationships and incidents around the family. The only true policing stories include Otis' lone appearance in Otis the Deputy, where Andy gets captured by a pair of bank robbers, and Howard and a very soused Otis come to his rescue. Another features the return of Knotts in a pair of back to back episodes. In A Visit to Barney Fife Andy heads to Raleigh to see his old friend but his former partner doesn't quite make the impression he would have liked, especially the fact that he is one step away from being kicked off the force. When Barney Comes to Mayberry, the unexpected welcome he receives is even more surprising than he imagined. 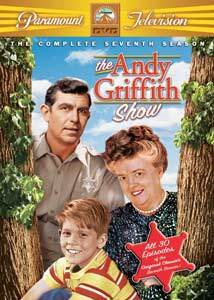 One of the features of The Andy Griffith Show is the relationship between Andy and son Opie, and that continues here. There are a few lessons to be learned in life, and Opie is about to find out one of them in Opie Gets a Girlfriend. Helen's neice arrives, and after a rough start, she and Opie become friends, that is until she shows him up in just about every activity they compete in. When Opie returns home with a black eye, Helen has some advice for her neice that will smooth things over, but Andy will require the same treatment. That's not the only lesson Opie has on his plate. When Opie Finds a Baby abandoned on the steps of the court house, he and friend Billy decide to keep it a secret from Andy, but their inquiries about the subject around town have everyone insisting Andy give his son "the talk", a topic he'd rather not broach. After begging to learn to play, Andy sees only one solution when Opie's Piano Lesson conflicts with football practice. Opie's plans to write an essay on his father become a far bigger challenge than he had imagined in Opie's Most Unforgettable Character. The Ball Game, one of the highlights of the season, finds Andy reluctantly agreeing to umpire the big baseball tournament against Mount Pilot, but a crucial call turns the whole town against him�including Bee and Opie. Aunt Bee takes center stage in a number of episodes. In Aunt Bee's Crowning Glory, her doning of a wig causes complications in the presence of the latest sensation in town, the unattached stand-in minister. Then, it's a battle of the sexes when Bee decides to run for office (Politics Begins at Home) and her hopes of usurping Clara's reign as Mayberry's floral queen take a beating in Only a Rose. After finding a lucky penny, Bee goes Chinese when she opens Aunt Bee's Restaurant, but her fortunes may not be all she had hoped for. When Floyd and Bee express concern over Goober's well being after a minor fender bender (Mind Over Matter), the Taylor residence becomes a convalescance home until Andy finds a cure for his ailments. Goober gives a new meaning to "hair brained" when he feels inferior to his classmates in a history class, but after coming back from a camping trip sporting a new beard, he gains a new sense of intellectualism that has his friends wishing for the old Goober (Goober Makes History). With Bee out of town, Andy has more on his plate than he can handle when Goober mixes up the dining arrangements in Dinner at Eight. With competition from another filling station, Goober's Contest goes awry when the printer mistakenly includes a winning ticket with a substantial prize�and Floyd thinks he's won. Change doesn't come easy in Mayberry. There's A New Doctor in Town, (guest star, William Christopher) but his youth has everyone avoiding being his first patient, and when the town's milk delivery gets modernized and the old wagon horse is put out to pasture, Opie has his hands full dealing with the dispondent animal in Goodbye, Dolly. Helen finds herself at odds with the principal over The Senior Play. Jealousy rears its head when Andy's Old Girlfriend returns to Mayberry, and when Helen lands a publishing deal, Andy's nose gets out of joint in Helen, the Authoress. The Darlings make their final appearance on the show, and it's a humdinger. The family has come into a fortune (a whopping $300! ), and Briscoe has decided it's time for his boys to get hitched, but when an omen casts Helen in the role of wife-to-be, Andy has to do some fancy work to set things straight. Competition for the commission of a new statue uncovers the unpleasant truth about the Taylor ancestry (The Statue) and when a stranger appears (Don't Miss a Good Bet) looking for investors to recover a lost treasure, the potential rewards encourage a loss of sensibility among the Mayberry residents. This would be the last season for Howard McNear (Floyd the barber) as his failing health leaves him relegated to sitting through most of his scenes. Fortunately, he gets a fair bit of coverage, including a spat with Howard Sprague (Floyd's Barbershop), whose character is promoted to a more prominent position, becoming a feature player in a number of episodes. First, Howard's chances of joining The Lodge are sabotaged by his interfering mother, then, when he develops a sore throat, The Barbershop Quartet risks forfeiting their trophy to Mount Pilot, unless Andy can find a replacement without being conned. Howard makes his first fishing outing, landing a legendary catch in Big Fish in a Small Town, much to everyone's displeasure, and his volunteering as a Big Brother gets him in trouble with a big sister. Finally, in Howard, the Comedian the town is upset after he lampoons his friends on a television talent show. Image Transfer Review: Overall things continue to look very good here. The source is very clean and free of any major defects. Colors are strong without being over saturated, and black levels are solid. The occasional episode appears just slightly on the dark side, resulting in less shadow detail. Audio Transfer Review: For the most part, audio is well presented, and dialogue is easy to discern. There is some occasional distortion and a couple of episodes have poorer quality than the rest, suffering from a mild warbling. Extras Review: There are no extras included in the set save for a single ad for I Love Lucy. Packaging is thoughtfully designed with more appropriately themed artwork. The five discs are again housed in Thinpaks with episode synopses on the inside. Although the approach has shifted somewhat, The Andy Griffith Show still has its magic in its seventh season, with another fine collection of episodes. Recommended.